What a week it has been! You know that feeling when you get through a major time in your life and at the end of it you can pat yourself on the back and say ‘We did it’! Well that’s me today. I am amazed at how, when we ask for help, it will always come. It may not be packaged in quite the way we expect, but it does come in some way, shape or form, maybe in ways that don’t even seem obvious until after the event. I am so thankful. To the point of being slightly overwhelmed by how GOOD God is, and how He has taken care of so many things that I couldn’t manage on my own. And all because I simply asked for Him to send help. In my last blog I wrote about my love being holed up in hospital, with no idea really when bypass surgery was going to take place. He was taken out of the picture for a few reasons. Mainly because he was instructed by the ‘Powers That Be’ to not lift anything heavy, and let’s face it, when you move house there’s quite a lot of heavy lifting to be done. And also because clearly he was not in control – someone way higher than him was the Director Of Operations last week. And what a fine Director He was too. I laid out my need for help early last week in a simple prayer ‘Lord please send help’. The help came in many forms; my brother came and mowed the lawns ✅ and my sister-in-law cleaned windows. 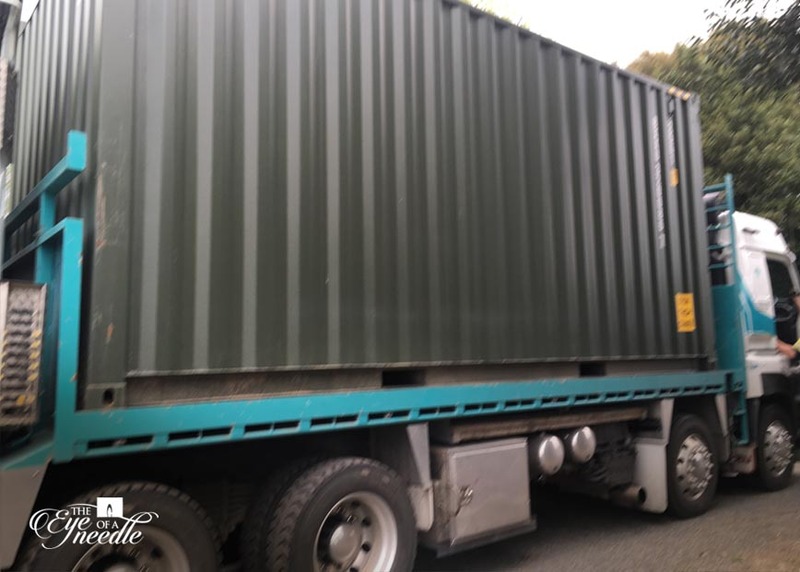 ✅ I phoned the ‘Man with the Van’ and asked if I could have more strong men to move furniture on moving day ✅ and I received clear direction on who to call to help move the container ✅ I also found a great place 5 minutes from our new place where the container is stored. All because I knew I could not do everything myself. That scripture which tells us to ‘ask and we shall receive’ was all too relevant for this girl last week. I also know there were some of you praying for me too, and I want to thank you, because I sure felt uplifted. It’s a pretty big job moving house on your own while your honey is recovering from heart surgery in hospital. Just to back up the truck a bit – bypass surgery was scheduled for Tuesday. There were a couple of attempts to change that at the last minute, but in the end my man was wheeled down the corridor and into surgery at 7am, and a 5 hour operation took place. I was phoned once surgery was complete and made my way to ICU to witness what happens after a hefty anaesthetic starts to wear off. I had already decided to write off the day from any kind of packing, and even though you know the medical staff are in full control of what to do, it was still nice to be there, even if none of us remember much. At 6pm the patient was wheeled back to the ERU ward for 24 hour observation & care. I have to take my hat off to the nurses in that ward. They know their stuff! And every attention to every detail was adhered to. I’m sure there must be some very unwilling and difficult patients to deal with – fortunately I don’t think my man was one of them. But I do have a new admiration for the Doctors and Nurses and for all the hard work they do as professionals to make their patients comfortable, explaining procedures and aiding in their recovery. It was a long day. And lovely to climb in to bed that night knowing that at long last, surgery was over and we could now start on the road towards making a full recovery without any more questions around timing and waiting for things to happen. My patient has made a remarkable recovery. Every day that I visited there was a marked improvement – drains removed, mobility increased, colour back in the cheeks and conversations beginning to flow – morphine has a way of making you feel very spaced out, and sometimes our conversations felt very disjointed. I had bigger fish to fry for the rest of the week, so the daily routine involved doing as much packing and cleaning as I could between the hours of 9am and 3pm and then it was tools down and a drive to the hospital for a couple of hours. It’s quite easy packing up a house when you are the only one in it, so I only needed to leave out one plate and one cup to get through the week. I was amazed at how seamlessly the week went, and I am quite sure I had supernatural help as nothing felt stressful and everything just seemed to flow. By the time the truck arrived on Friday I was so ready to go and basically followed the guys through the house with the vacuum cleaner. The loaded truck was on the road by 1pm and the container left on another truck an hour later. I took some time to finish those last minute jobs and by the time I arrived in Taupo the truck was almost completely unpacked, with my friend Liz being the Director Of Operations at the new house. I was so thankful for my good friend Rachel who came up from Hastings the next day to help me unpack, and once I had done a big supermarket shop on Sunday, it was time to head back to Hamilton to collect the recovering patient from hospital and bring him home. Our next few days and weeks ahead will be focusing on making a full recovery, one day at a time. Already in our cute little house we feel grounded, and know that this is where the business will start to flourish. The real work is about to begin. Watch this space, as our new branding and upgraded website will be launched in the next couple of weeks. I am working very closely with a local Advertising Agency who are building the online shop to a new level, and it is looking great. The Eye Of A Needle moves from being just a blog, to being an online shop to becoming a physical shop in town. We have heaps of photos we need to take (that’s a great job for a recovering bypass patient!) and now that we are here, we can start to look for the ideal shop premises.